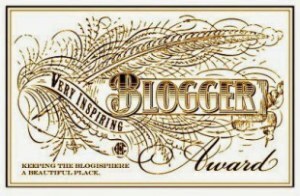 I was nominated for the Very Inspiring Blogging Award from Melissa Barker-Simpson. So immediately I shared this nomination with my kids who for the last days of school are bring home all kinds of awards – see ol’ Mom gets noticed from time to time too. I think my 9 yr old just rolled her eyes. No, seriously this was quite a nice surprise and I thank Melissa for the recognition. If you like to write and be inspired, certainly check out Melissa’s page. It’s a fun one with contests, prompts and tips – a good one for writers looking to connect and stretch your creative bone and those finger tips on the key board. 4. Drop them a comment to let them know you have linked them in the post. 2. I have the genetic gene that allows me to flip my tongue over to each side, and have passed that beauty of a gene onto my daughters – nope husband can’t do it, cracks us all up. 3. I can type over 75 words a minute without looking at the keyboard. My mother made me take a typing class (I moaned about it at the time) to have something to fall back on – who knew, I’d use it everyday with the computer. The woman was genius! 4. I own, 3 Kindles. Yep the newest one is a PaperWhite Kindle and my total favorite. My teen and husband have adopted the older models. Can someone have too many books or eReaders? I think not! Yes, I’m also guilty of having a hard back copy and eBook copy of the same book (doesn’t everyone?). 5. I have lived in 10 states and 2 countries so far in my life. My top choices where I’ve lived so far; Germany, Florida, Tennessee, Kansas and Oklahoma – fond memories that have really shaped me. Someday I may live in Italy too 🙂 Come on lottery ticket! 6. My all time favorite TV shows, in which I own DVDs for are: Smallville and Boston Legal. I’ve been watching Smallville again lately, Superman is awesome! Tom Welling isn’t too bad to look at either, purrr. 7. I love Mike Rowe’s voice, doesn’t matter what he’s narrating that my husband is watching (Dirty Jobs, Deadiest Catch, Paint drying on a wall) – I will find it interesting because his voice is swoon worthy. Sorry Morgan Freeman, Mike’s an opera trained manly man and funny to boot. Mike sing me a lullaby… total bucket list wish right there! You’re welcome! Certainly deserving of it! Thanks for nominating me, Cassie. That’s really nice of you. Strangely enough, I was thinking of Boston Legal only this morning, and wondering whether I had seen all the episodes. I really liked that series. Hi, Cassie. I’m so sorry I missed this post, and I’m glad I came by to check out your news. I really enjoyed the facts you shared; yet more evidence of the things we have in common. Not too sure about the shark thing though! The dominating emotion for me is fear 🙂 I laughed at the tongue flipping thing because this resonates within my own family. I can’t do it and everyone finds this highly amusing. I’m with you on the typing thing. I took a class and it’s served me well. I don’t know who Mike Row is, but I’m going to youtube it right now! Thanks so much for sharing, and I apologise again that I’ve been living in a bubble for the last few weeks! Thanks Mel. I hope your enjoying the summer (aka – a bubble) 😊. I’m enjoying the prompts on your blog, so fun! All the best. I’m so glad 🙂 all the best to you.